It’s back by popular demand. 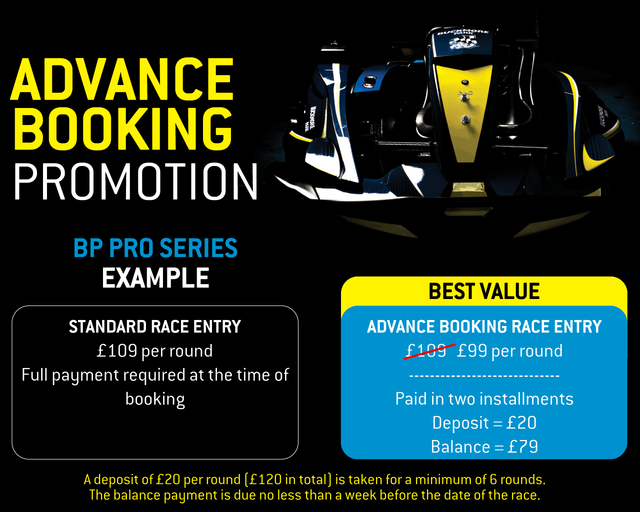 The advance booking promotion is a triple win, it secures your space, spreads the cost of race fees and saves you money. Simply commit to 6 rounds of your choice in any of our adult championships and not only will your space on the grid be guaranteed, but you will also receive a £10 discount on the price of each race. Step 1 - Choose your dates. To qualify for this promotion you need to choose a minimum of 6 rounds, you can choose all 8 if you wish. Step 2 - Give the team a call and let them know the championship and dates you want to enter. At the time of booking, you will be required to pay a £20 deposit into each round, that’s £120 deposit total for 6 rounds. Step 3 - We will secure your space on the dates of your choice, and minus the promotional discount from the entry price. No less than a week before each race, you will be required to pay the remaining balance on each event. The advance booking promotion can be used on the following adult championships.